Jack White is coming to North America and Europe! We are committed to getting tickets into the hands of fans. Not scalpers or bots. So we’re collaborating with Ticketmaster Verified Fan® to leverage powerful technology to create a better, more reliable way for fans to shop for tickets to see their favorite artists, like Jack White – without racing against scalpers and bots. Every online ticket purchased in North America includes a physical copy of the forthcoming Jack White album Boarding House Reach. Fans will have the option to upgrade their CD to the standard black vinyl single LP. A separate email be sent with instructions on how to redeem the album(s). Release date is March 23, 2018. Please allow 7-10 days for delivery once the album becomes available. Please Note: Album must be redeemed by May 3, 2018. Valid for U.S. and Canadian residents only. Not valid for tickets purchased via resale. Listen to Jack White’s new single, “Connected by Love,” from his upcoming album BOARDING HOUSE REACH now. Registration closes on Friday, January 19 at 11:59PM ET. Below are some commonly asked questions to provide more details while registration is open. How do I register for the Jack White Verified Fan Presale? 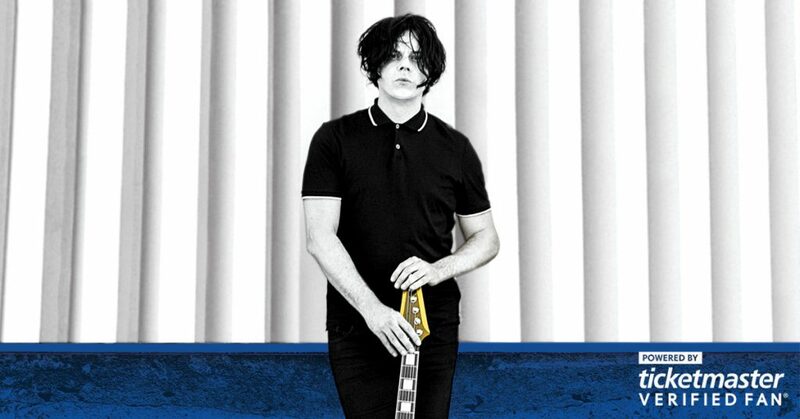 Go to https://jackwhite.tmverifiedfan.com/ to complete your registration for the opportunity to receive an invitation to the Verified Fan Presale. What shows will be available for purchase through Verified Fan? Jack White is using Verified Fan for dates across North America and Europe. When you complete your registration, you’ll be able to view and select from the available dates. You can also visit http://jackwhiteiii.com/news for the latest tour news. Is there a way to purchase tickets other than the Verified Fan Presale? Yes. In addition to the Verified Fan Presale, there will be a general public onsale that begins on Friday, January 26 at 10AM venue local time. If you are verified and randomly selected, you may shop for tickets during the Verified Fan Presale. In addition to the presale, there is a general public onsale that begins on Friday, January 26 at 10AM venue local time. Can I register for the Verified Fan Presale from outside the U.S.? Yes, you may register for the Verified Fan Presale from outside the U.S., be sure to include your country code with your mobile number. If you are interested in attending shows in Europe, please select the European registration option on the main landing page before you begin. If I am selected, how long do I have to shop for tickets during the presale? While we suggest you purchase as soon as you are able, we understand there may be some planning involved. You will have until Thursday, January 25 at 10PM venue local time, to shop for tickets during the Verified Fan Presale. As a reminder, due to demand, tickets are available on a first-come, first-served basis. Can I register for the Verified Fan Presale more than once? We know you’re excited, but please don’t register more than once. Creating multiple new Ticketmaster accounts will not increase your opportunity to receive an access code. I registered more than once, will I be disqualified? Don’t worry, you will not be disqualified. If you registered more than once to correct a mistake, such as an incorrectly entered mobile number, we will take the last registration submitted. I received a confirmation email, what does this mean? We have successfully captured your registration and this is a confirmation of the details. On Tuesday, January 23, you’ll receive an email with additional information about your Verified Fan Presale invitation status. Does registering mean I’m guaranteed to receive an invitation to the Verified Fan Presale? No. All registered fans who are verified will be equally eligible to receive an invitation for the Verified Fan Presale. However, if Verified Fan demand exceeds ticket supply, fans may be selected at random to participate in the Verified Fan Presale. Due to a limited quantity of tickets for the Jack White Presale powered by Ticketmaster Verified Fan, they will be available on a first-come, first-served basis and are not guaranteed. Does getting an access code mean I will get tickets? If you receive an access code you will have the opportunity to shop for tickets. However, due to demand the ability to purchase tickets is not guaranteed and tickets are available on a first-come, first-served basis. When is the Verified Fan Presale? The presale will begin on Wednesday, January 24 at 10AM venue local and end on Thursday, January 25 at 10PM venue local time, for fans who receive an access code to shop during the presale. To allow as many fans as possible to see Jack White on his tour, there is a four (4) ticket limit MAXIMUM per purchaser. Please visit http://jackwhiteiii.com/news for the latest tour news, tour dates and ticket information. How do I learn more about the tour? Please visit http://jackwhiteiii.com/news for the latest tour news and dates. If my parent or guardian uses their credit card to buy, does the person’s whose name is on the card have to attend the show?